Thank your for your interest in the Zippah Recording Workshop. To apply, fill out the form below. We will contact you shortly after reviewing your application. After an applicant is accepted, a Tuition payment of $400 will be due to secure enrollment. Be sure to review the Payment Terms below. Have you ever held an internship or position at a recording studio? 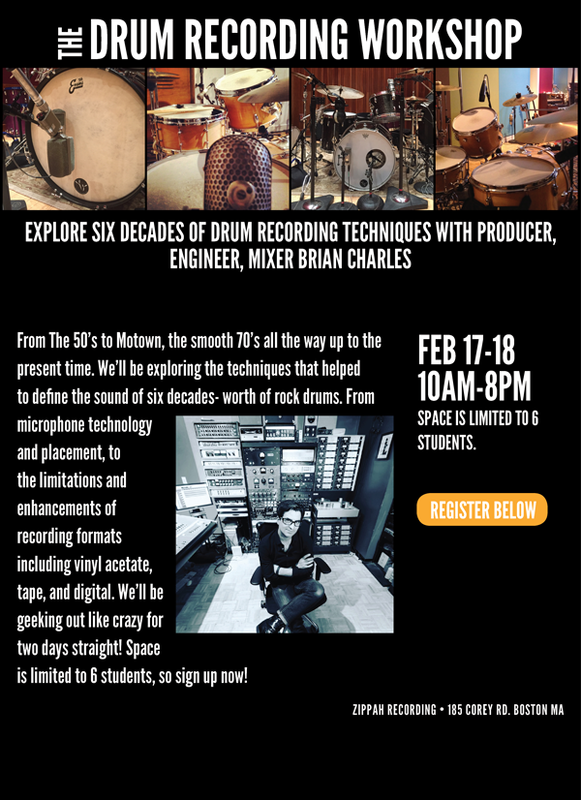 Tuition for The 2 day Drum Recording Workshop program is $400. All tuition must be paid in full before starting classes and are not subject to any increases during the terms of this enrollment agreement. All payments are 100% refundable, provided notification is received by the workshop coordinator no later than 2 weeks prior to the first class. Students who withdraw after partially completing their training are not entitled to any refund, but are given program credit equal to the time needed to complete the workshop. Students who withdraw from classes due to personal illness or emergency may, with administrative approval, return at a future session to complete their training with no additional tuition charge. Students must obey all local and state laws and are expected to conduct themselves in a professional manner. The Workshop reserves the right to terminate the enrollment of any student guilty of disruptive behavior or the destruction of studio property. Students who have any handicap that could prevent the use of this training for successful on-the-job performance must discuss this condition with the Coordinator prior to enrollment.